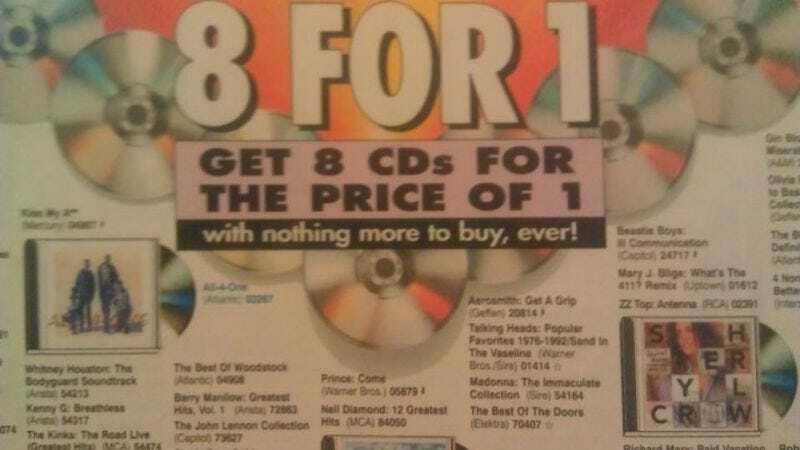 On Monday, the current owner of Columbia House—whose shady math The A.V. Club wrote about back in June—filed for chapter 11 bankruptcy protection in New York, surprising everyone who had no idea the mail-order media behemoth was still in business. The Wall Street Journal reports that Filmed Entertainment Inc., whose parent company, Pride Tree Holdings Inc., bought Columbia House in 2012, blamed “the advent of digital music and dramatic changes in technology that are threatening to render CDs and DVDs obsolete” for the filing. As a result, FEI’s 2014 net revenue was a paltry $17 million, a far cry from the $1.4 billion Columbia House reportedly generated in 1996. “This decline is directly attributable to a confluence of market factors that substantially altered the manner in which consumers purchase and listen to music, as well as the way consumers purchase and watch movies and television series at home,” FEI director Glenn Langberg said in the court filing. Even before the bankruptcy, the Columbia House of today bore little resemblance to the 8-albums-for-a-penny business of yore. It stopped selling music years ago, and instead focused on a mail-order DVD club, which currently has an astonishing 110,000 members. Columbia House also has no employees—according to the WSJ, a third-party fulfills the club’s operations—and just $2 million in assets against $63 million of debt. If there’s a silver lining, it’s that FEI is looking for a buyer for Columbia House, and there are reportedly “about 20 potential purchasers” interested. So perhaps in the coming years, there might be a nostalgia-fueled resurgence of ordering music or movies through the mail for slightly inflated prices (plus shipping and handling).